In a few hours the Holiest Day of the year begins here in the US, in Israel it started a few hours ago. It is Yom Kippur. 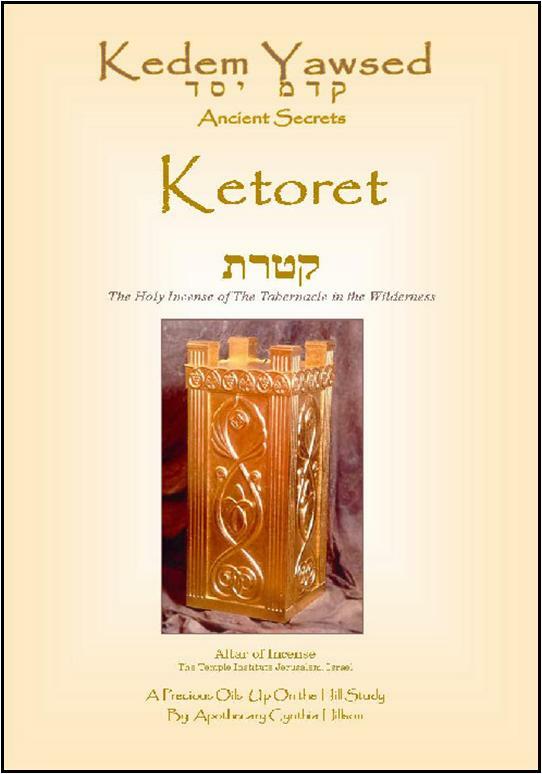 I’ve written about Yom Kippur in my Esther’s Days of Purification as well as published a small teaching called Ketoret. Earlier this year I began to compile a number of other notes to make the Ketoret a complete teaching. Even with all the craziness of me preparing to depart to Israel for six weeks I felt this information was important. Ironically, I will be spending most of my time on the ancient incense trail while I am in Israel. Ketoret has the unique property of protection as a fumigation as we look into the Hebrew word. (Strong’s H7004 קטרת qeṭôreth ket-o’-reth From H6999; a fumigation: – (sweet) incense, perfume. A primitive root (rather identical with H7000 through the idea of fumigation in a close place and perhaps thus driving out the occupants); to smoke, that is, turn into fragrance by fire (especially as an act of worship): – burn (incense, sacrifice) (upon), (altar for) incense, kindle, offer (incense, a sacrifice). While today we normally wouldn’t be using an incense burner/censer with whole spices ground into an incense powder as a fumigation we do use essential oils with a diffuser. Yalkut Meam Loez cites a story from Midrash Haneelam. Rav Aha was exhausted and fell asleep. He dreamt that it was told to him, “Just as you eliminated the plague from the city, so must you bring them back in teshuva, for one cannot endure without the other, because it was on account of their sins that the plague was decreed”. He told this to the townspeople and they repented. They changed the name of the town to “Mahsiya,” which means “town of compassion”. They kept the town’s name in their minds at all times so as to ensure that they would not return to their sinful ways. The following is excerpts from a rare book from David Israel Macht written 1928. I’m including this information because of the importance of the ingredients of the Holy Incense and how the pharmacological essence of the incense affects us. The World War was instrumental, (Remember only one world war had happened at this time in history) in connection with the impetus given to the search for antiseptics and germicidal properties of various essential oils; as for instance so well described by Cavel. This antiseptic action of volatile oils was un-doubtly responsible for the remarkable medicinal virtues of various balsams used in ancient times, especially in the treatment and healing of wounds. Oh my, as I read this I had to run to my library. I pulled Gattefosse’s Aromatherapy book off of my shelf and nearly fainted as I read. Now that I’ve picked myself up off the floor I have to tell you the importance of not only Gattefosse “coining” the word aromatherapy, (many believed he did so in 1928); the same year that Macht wrote the above. As I began to re-read Robert Tisserand’s Editor Introduction my eyes fell to these words. Essential oils, such as Tea Tree Oil as we know today aren’t the infused oil that were used in Biblical times. There is much controversy about essential oil discovery but it is of our research that a Persian physician, Ib’n Sina, better known as Avicenna (980 A.D.-1037 A.D.) who was a celebrity throughout the Arab world is the one who greatly contributed to the process when he introduced the use of a refrigerated coil in the distillation process of plants. It is believed that distillation of aromatic flowers and essential oils methods were done in basic and mostly crude stills that were used before his discovery. Avicenna was highly advanced in many ‘modern’ methods of medicine many which are still used today. His published works included The Book of Healing and the Canon of Medicine. He is also accredited with writings on the use of over 800 medicinal plants. The NAHA writes: Distillation appears to have been practiced throughout ancient times. Based upon the current interpretation Paolo Rovesti’s discovery of an earthenware distillation apparatus, the production or extraction of aromatic oils by means of steam distillation, has been known for 5000 years. During the fifth century AD, the famed writer, Zosimus of Panopolis, refers to the distilling of a divine water and panacea. Throughout the early Middle Ages and beyond, a crude form of distillation was known and was used primarily to prepare floral waters or distilled aromatic waters. These appear to have been used in perfumery, as digestive tonics, in cooking, and for trading. Although an extensive trade of odoriferous material has been shown to have occurred in the ancient Orient and ancient Greece and Rome, the oils used were not essential oils per se, “rather they were obtained by placing flowers, roots, and other plant material into a fatty oil of best quality, submitting the glass bottles containing these mixtures to the warming influence of the sun and finally separating odoriferous oil from the solid constituents”. www.naha.org/explore-aromatherapy/about-aromatherapy/how-are-essential-oils-extracted. Oh, remember how the year 1928 stuck out to me as when the term “aromatherapy” is thought to be coined and David Macht wrote his book on the Holy Incense the same year? Well, my friend, another “factoid” I found on 1928 is when I was researching penicillin and how it was discovered on Sept 15, 1928. Penicillin is one of the earliest discovered and widely used antibiotic agents, derived from the Penicillium mold. Antibiotics are natural substances that are released by bacteria and fungi into their environment, as a means of inhibiting other organisms – it is chemical warfare on a microscopic scale. In 1928, Sir Alexander Fleming observed that colonies of the bacterium Staphylococcus aureus could be destroyed by the mold Penicillium notatum, proving that there was an antibacterial agent there in principle. This principle later lead to medicines that could kill certain types of disease-causing bacteria inside the body. Have you read Steven Harrold Buhner’s books, Herbal Antibiotic’s and Herbal Antiviral’s? Buhner gives insight the why and how’s of getting back to plant-based medicine as he gently warns us of the soon-coming lack of antibiotics’. Perhaps, as the pharmaceutical antibiotics diminish, and are no longer being researched against the superbugs, it is a reason for us to know the power of God’s plant kingdom and learn more about herbal and natural remedies including, but not limited to, essential oils? Perhaps that is why there is such a “buzz” about the essential oils? He who has “ears” listen to what the spirit is saying. You can order the Ketoret booklet with the additional notes included from my web site. http://www.shop.thefragrantbride.com/. With the Ketoret teaching you will also receive a small vial of Ketoret. This offer will end 4 Oct 2014 @10 am and be mailed out on Monday, 6 Oct 2014. Categories: Uncategorized | Tags: Ancient Incense Trail, Apothecary Cynthia Hillson, Biblical Aromatherapy, Cynthia Hillson, diffusers, essential oil blend, Essential Oils, Frankincense, Frankincense and Myrrh, From Petra to Gaza, Healing Leaves, Healing Oils, Myyrh, Oils of the Bible | Permalink. Cynthia Hillson has been married to David for 37 years. They are the parents of six children and grandparents of seven. Precious Oils Up On the Hill is the ministry Cynthia began in 1991 after a three-day encounter with the Holy Spirit where she was instructed to “anoint the nations” and “prepare the Bride”. Cynthia is a Modern Day Apothecary who teaches about Biblical fragrances for personal delight, physical health, and spiritual growth. Cynthia lovingly calls her books and workshops a “Show and Smell” ministry. Cynthia's other passion is taking love and comfort to Israel; something she has done 36 times since 1999. She invites you to travel to Israel in the Spring of 2019 for a plant-based tour of Israel where you meet my fragrant friends as well as visit some of the key sites throughout Israel from the Galilee, to the desert to Jerusalem.